Mrs. E and I have a dear old friend from her graduate school days. Actually there was a tight group of friends who would gather at my apartment and debate, as serious students do, lofty subjects, the veracity of some new piece of gossip and the outrageousness of the faculty who taught them. I would stumble home from work at some horrible hour around 11:00PM (I don’t miss my days in retail) to find them all sprawled out on the flimsy cardboard and foam couch, futon or under the coffee table. The air was blue with cigarette smoke and thick with cooking oil. That was my first clue, before even opening my door, that Iñigo was in attendance. Iñigo is Basque. He was also incorrigible, is very knowledgable and remains a pretty good cook. He would have made the group dinner (with whatever I had in the icebox) and left a plate for me warming in the oven. Mrs. (then Ms.E) would shake me a very cold martini and draw a tub of epsom salts and hot water for my swollen feet. That night in particular, I remember Iñigo (referred to as the unhealthiest man alive) telling me to sit down, because I looked like hell. Yikes. That night I fell asleep on the couch listening to literary criticism, the great debate over fileting fish with only your hands (“To get out the bones”) and …. you get the idea. They were wonderful evenings. You never really feel as intelligent as you do discussing your subject while you’re actually in school, do you? I bring those evenings up because the discussions swirling around me were conducted fluently in at least two languages with a smattering of a third when a certain word was missing from the speaker’s vocabulary. Mrs. E was studying Spanish Literature. A genre that Iñigo García-Ureta has once again added to. 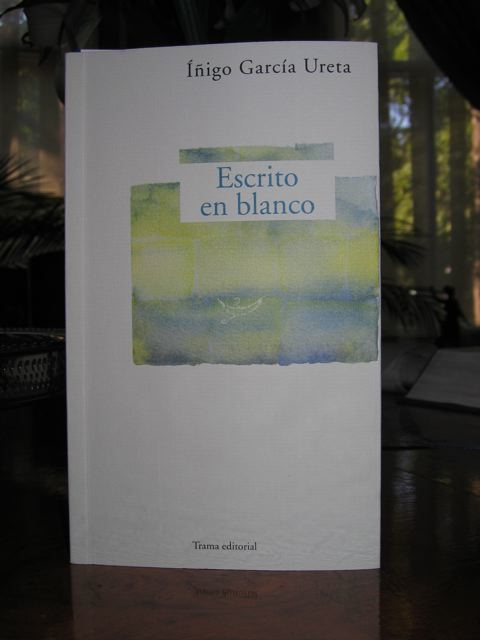 I have a copy on my desk of his latest essays Escrito en Blanco. I know it must be very good. The Times Literary Supplement says it is. Iñigo’sReviewTLS…. Of course, I can’t read the book. Which frustrates me to no end. I studied French, so I’m OK with cognates, but there is a lot more to reading than figuring out words or phrases because they sort of look like something else in another language. We Americans don’t always think to learn another language. This is a big country, we can’t (generally) drive an hour, cross a border (the Mexican, Canadian and Mason-Dixon not withstanding) and have to deal with another country’s culture and language. But Gary Cooper was fluent in French. So was Grace Kelly….. Audrey Hepburn spoke a couple of languages (being Dutch) and so did a host of the most elegant people of history, literature and film. At one time it was thought to be indespensible. This entry was posted in Cultivating and tagged authors, books, Cultivating. Bookmark the permalink. “the unhealthiest man alive”? Ah, I love it!!! Times have changed my old friend. You’ve got me beat in the wholesome living department these days!